ALL NEW PATIENTS RECEIVE CUSTOM WHITENING FREE with a complete exam and cleaning. Call (519) 885 -1818 today! Sometimes the biting edges and the sides of the teeth whiten more quickly than the rest of the teeth. This occurs because your enamel is thicker in these areas and responds faster to the whitening process. As you continue to use Nite White® the rest of your teeth will catch up and the color will blend in. The gum half of the tooth will in nearly all cases be slightly darker than the biting half but will have a smooth transition in color. 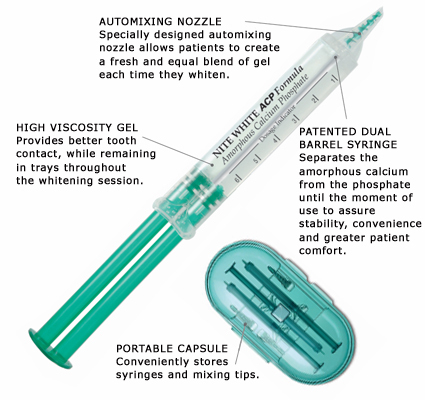 Unlike traditional desensitizers, Nite White ACP’s patented Amorphous Calcium Phosphate technology3 rapidly precipitates calcium phosphate crystals on the surface of and also inside dental tubules to substantially reduce transient sensitivity. Enamel is almost entirely composed of calcium phosphate minerals. Nite White ACP’s patented Amorphous Calcium Phosphate chemistry naturally bonds with the tooth surface, filling microscopic tooth defects and improving the overall smoothness and luster of patients’ smiles. Additionally, clinical testing shows that patients experience less fadeback after 6 months with Nite White ACP. Contact us today for and appointment and get started towards a smile you have always deserved.